The Vancouver referencing style is a numeric system used in biomedical, health and some science publication. This referencing guide is to be used in conjunction with the Library's General guide to citing and referencing. EndNote users can format their references using the Vancouver-NIH style file available in EndNote online/desktop. Author’s Surname INITIALS. Book Title. Edition (if not first). Place of publication: Publisher; Date. Glover IA, Grant PM. Digital Communications. 3rd ed. Harlow: Prentice Hall; 2009. Note: If there are no authors, only editors, use the same format as above and follow the last named editor with a comma and the word editor or editors. Li CW, Wang GJ. MEMS manufacturing techniques for tissue scaffolding devices. In: Bhansali S, Vasudev A, editors. Mems for Biomedical Applications. Cambridge: Woodhead; 2012. p. 192-217. Note: Pagination is always shortened to the fewest numbers necessary. For example you would write 23–5, not 23–25. Author of paper's Surname INITIALS. Title of paper. In: Editor of proceedings' surname INITIALS, editor(s). Conference Title; Conference date; Place of conference. Place of publication: Publisher; Publication date. Pages. Rice AS, Farquhar-Smith WP, Bridges D, Brooks JW. Cannabinoids and pain. In: Dostorovsky JO, Carr DB, Koltzenburg M, editors. Proceedings of the 10th World Congress on Pain; 2002 Aug 17-22; San Diego, CA. Seattle (WA): IASP Press; 2003. p. 437-68. Author’s Surname INITIALS. Book Title [Internet]. Edition/version. Place of publication: Publisher; Date of original publication [Date cited]. Available from: URL. - If there are more than 6 authors, list the first six then add et al. - Journal titles are abbreviated. 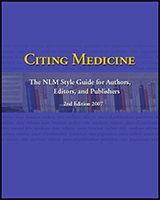 You can use the NLM Catalog (https://www.ncbi.nlm.nih.gov/nlmcatalog/journals) to find the correct journal abbreviation. - Do not repeat page numbers unless they are followed by a letter. For example 123-125 becomes 123-5 but 124A-126A is correct. - If no numbers appear on the pages of the article, it is usual to give an estimation of the length in square brackets. For example [20 p.] or [10 paragraphs]. Author’s Surname INITIALS. Title of article. Title of journal (abbr). Date of publication;volume number(issue):pages. Pollack CV, Reilly PA, Eikelboom J, Glund S, Verhamme P, Bernstein RA, et al. Idarucizumab for Dabigatran reversal. N Engl J Med. 2015 Aug 6;373(6):511-20. Author's Surname INITIALS. Title of article. Newspaper title. Date;Section: (column). Levine S. Obesity increase creating special needs. Miami Herald. 2006 Jan 4;Sect. A:1 (col. 1). - Sections may be named, for example 'Metro Section', 'Holiday Extra', etc. Use these names in a reference only when the section lacks a number or letter. Note: When a location (pagination) for the article is not provided, as often occurs, calculate the length of article using the best means possible, e.g. in terms of print pages, screens, or paragraphs. Inventor's Surname INITIALS, inventor(s); Assignee's name, assignee. Patent title. Patent country and document type Country code and patent number. Date issued. Page E, Harney JM. Health hazard evaluation report. Cincinnati (OH): National Institute for Occupational Safety and Health (US); 2001 Feb. Report No. : HETA2000-0139-2824. Note: When a division or other subsidiary part of a publisher appears in the publication, enter the publisher name first. For example: Harvard Medical School, Department of Genetics. Author's Surname Initials. Title [publication type]. Place of publication: Publisher; year. Roberts S. Studies of the origins and control of occupational exposure to cytotoxic drugs [PhD thesis] Bath: University of Bath; 2008. Harston DN. Formation of cancer cells [MRes dissertation]. London: University of London; 2014. Emails, letters, conversations, interviews and lecturer's presentations are examples of sources that are often unpublished. Documents generally available to scholars in an archive or a depository can usually be included in a reference list. However, many publishers do not permit placing any form of unpublished material in the end references. Most authorities recommend placing references to personal communications such as letters and conversations within the running text, not as formal end references. Include the nature and source of the cited information, using a term or terms to indicate clearly that no corresponding citation is in the reference list. Place the source information in parentheses. Author(s)/Organisation. Title of webpage [Internet]. Place of publication: Publisher; Year of original publication OR Year of Copyright [updated year month day; cited year month day]. Available from: URL. National Institute for Health and Care Excellence. Antiplatelet treatment: management [Internet]. London: NICE; c2018 [updated 2018 Jun; cited 2018 Sep 28]. Available from: https://cks.nice.org.uk/antiplatelet-treatment. - Use the date that the page was first placed on the Internet. If it cannot be found, use the date of copyright, preceded by the letter ‘c’. - If neither a date of publication nor a date of copyright can be found, use the date of update/revision and/or the date cited. Vancouver is a numeric style, where citations are numbered (1) in the order of appearance. This citation leads your reader to a full reference to the source in the list of references at the end of your work. Each citation number should be enclosed in round brackets on the same line as the text, before any punctuation, with a space before the bracket (2). Once a source has been cited, the same number is re-used for all subsequent citations to the same source. At the end of your work, list full details of all of the sources which you have cited in your text in a section headed References, in numeric order. References listed must follow Vancouver's formatting guidelines (see reference examples from the first tab). Your reference list should allow anyone reading your work to identify and find the material to which you have referred. The references are listed in the order they appeared in the text, not alphabetically. 1. Royal Pharmaceutical Society. Careers information [Internet]. London: Royal Pharmaceutical Society; c2018 [cited 2018 Sep 28]. Available from: https://www.rpharms.com/resources/careers-information. 2. Newman RD. Malaria control beyond 2010. BMJ. 2010 Jun 11;341(7765):182-3. 3. Rang HP, Dale MM, Ritter JM. Pharmacology. 4th ed. Edinburgh: Churchill Livingstone; 1999. Referencing an item not covered in this guide? This guide to referencing for students and authors provides detailed examples for all print and electronic sources, business, government, technical and legal publications, works of art and images.